I am going to admit something to you. I don’t like planning and I actually enjoy NOT knowing what I’m getting myself into. 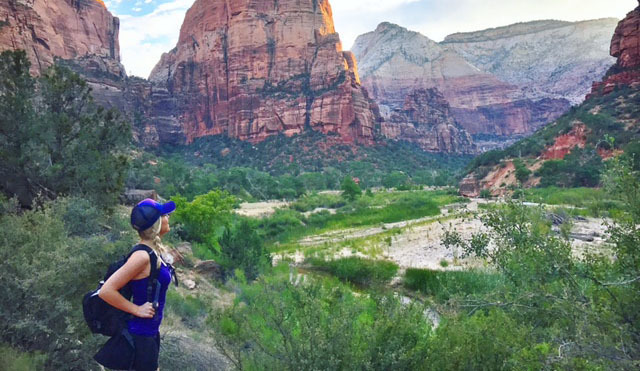 So when I went to Zion National Park I hardly did any research of the trails. When I have the time, I like to get to a destination and just do what I feel guided to. 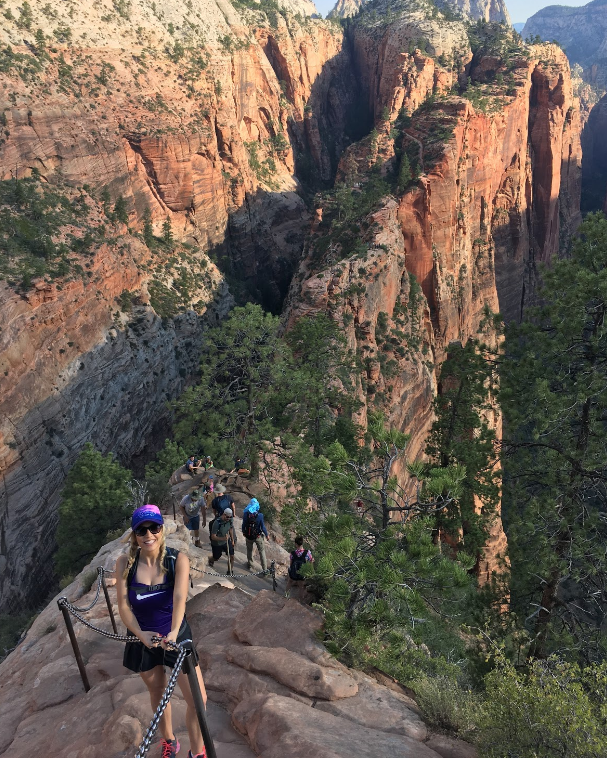 Everyone kept talking about Angel’s Landing. They say the summit is so high ‘only an angel could land there’. There are thousand foot drop offs on each side and you have to hold onto chains to safely make it to the top. Well, that sounded terrifying so of course I had to try it. The view at the beginning of the path is breathtaking. I stopped to take it all in and I recommend you do as well. You’ll never forget this spot. This is a 4.4 miles hike in and out with a 2073 foot elevation gain. The hike is rated at the difficult level but I felt it was physically not too hard, but mentally it was a challenge because I’m a little afraid of heights! The first mile or so is very steep but it’s a paved path. The payoff is great too. After the first major climb, you’ll arrive at refrigerator canyon. It’s shady, cooler path in between walls of rock. The incline calms at that point and you can just relax before the next great challenge. Walter’s Wiggles will rock your world! We’re talking about a series of 21 steep switchbacks that will have you panting. Okay maybe you’re more in shape and you that’s not true for you but I was definitely panting! Tip: There are restrooms for emergencies right after Walter’s Wiggles. I have a bladder disease called Interstitial Cystitis so these restrooms saved me! After Walter’s Wiggles, you’ll come to the first set of chains. That stint is short lived before you arrive at a great lookout called Scout’s Landing. Many people stop there trek here. You’re pretty high up, the view is fantastic… but you can get an even better experience if you dare to face the danger that lies past Scout’s Lookout. The last ¼ of the hike is the tricky part. The path is narrow and if you’re like me you will be holding onto the chains! The path can get crowded so you may need to make room for someone coming down the trail, which was the scariest part for me. While terrifying at times, this part of the hike is THRILLING! I forgot I was afraid of heights! The view at the top really is heavenly. There is a lot of space to spread out, snap pics and enjoy snacks. It’s truly astonishing how high up you are and how much beauty surrounds you in every direction. For me, the scariest part was coming down the trail because I was forced to look into the canyon. I highly recommend you at least try this hike if you head to Zion. If you’re nervous, make your goal to reach Scout’s Landing and see how you feel before venturing further. It’s worth testing your limits!